Roxanne Pallet just found out where Big Narstie gets his nickname. 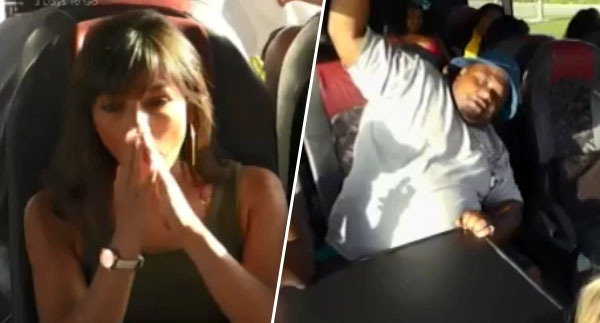 In the final episode of Channel 4’s Celebrity Coach Trip, which aired on Friday 25 January, the ex-soap star vomited at the smell when the rapper let one rip on the bus, full to the brim of alleged celebs and their pals. Pallet happened to be sitting right next to Narstie – whose real name is Tyrone Lindo – in the firing line of his flatulence. She wasn’t the only passenger to retch at the stink the Supernova songwriter expelled from his backslide, moments after proudly warning Brendan Sheerin, the longstanding Coach Trip guide, and his gang of reality TV travellers. Narstie dropped the bomb just moments after the bus set off for a full day of sight-seeing. There were many complaints from the surrounding victims caught in the crossfire, not just the 36-year-old reality TV show regular who you might remember from the unpleasant incident on Celebrity Big Brother when she accused her housemate, Ryan Thomas, of punching her on the arm. It almost smelled like something died in his stomach. Others agreed, but continued on with the journey like champs until Tattoo Fixer, Paisley Billings revealed the fart had ‘wafted back’. With the stench circulating, Roxanne’s palate simply couldn’t take the fart for too long, and she had to ask the bus driver to pull over, claiming she was going to vomit. As Big Narstie and the rest of the celebrities laughed at Roxanne’s reaction, Brendan followed her off the coach and urged her to get some air. Narstie’s pal Steve worried the rapper’s flatulence – which he blamed on the Spanish food later in the episode when he wouldn’t stop farting during a flamenco class – would lose them the chance of being crowned Coach Trip winners. He was right. Mutya Buena and Lisa Maffia were crowned this year’s winner of the series later on in the show, presumably praised for their perfectly pleasant smell, only masked by the bus which was surely shrouded in a faint whiff of desperation for fame from all those who board her. Celebrity Coach Trip airs on E4.